We first visited Ghent in March this year. The temperature dropped overnight from 17’C to -2’C, and we lay in bed watching the snow outside our window drift down onto the canal. Unprepared and under-dressed for such late winter weather, every foray outside was done at a fast march. It was most decidedly not the weather for contemplative maundering. I spent much of the weekend holed up in our lovely Airbnb apartment in Patershol. Last weekend was much warmer, and we sauntered happily through the city, pausing frequently to admire the beautiful buildings or leaning on the arched bridges to watch a variety of small boats chugging along the canals. In fact, aimlessly meandering through this eye-catching city is one of the best ways to spend your time here. Ghent, or Gent, is a busy port and university city in Flemish Belgium, built won the confluence of the Rivers Scheldt and Leie. It is also absolutely charming. In the late Middle Ages, it was one of the wealthiest cities in northern Europe, based largely on its wool and textile trades, and the proof is in its many glorious medieval buildings. The skyline of the old town is an endless delight of spires and turrets and stepped gables, the façades of its 15th century buildings decorated with Baroque and Gothic sculptures and carvings. The River Leie is lined with eclectic, elegant architecture such as the Fish Market, built in 1689, and topped with a statue of Neptune. Toreken, the oldest building on Friday Market Square, was built in the 15th century, and features a distinctive tower with a clock and a wind vane of the mermaid Melusine. The Old Post Office of Gent stands in the centre of the city. Now a department store, it was built barely a hundred years ago in the neo-Gothic style, and fits in beautifully with the rest of the older façades on the square. There are many churches in Ghent, but Saint Bavo’s Cathedral is undoubtedly the highlight – and it was only a stone’s throw from our spacious Airbnb apartment just off Brabantdam. The cathedral is enormous, and filled with fascinating sculptures, triptychs and paintings, some going back as far as the 8th century. I was gobsmacked anew by the ornate 18th century pulpit by Flemish sculptor, Laurent Delvaux, with its enormous apple tree spreading its branches over the pulpit like a vast umbrella. Then there’s the inexplicable presence of the skeleton of a whale behind the altar. Jonah’s? And we loved all the richly coloured stained-glass by Jan-Baptiste de Bethune, designed in the 19th century. The Cathedral’s prime attraction, however, is The Adoration of the Mystic Lamb. This is an altarpiece painted by Flemish artists, Hubert and Jan Van Eyck. It is a wonderfully detailed allegorical portrayal of the death of Christ, who is represented by a lamb on the altar at the centre of the painting. In March, it was also the only warm place in the city. In June, we were blessed with a free performance from a brass band visiting from the north of England. The city has a plethora of cafes and restaurants, which made it awfully hard to decide where to eat. A quiet backstreet for Thai or Persian, a busy restaurant on one of the main squares with a view of all the prettiest buildings, the stylish Pakhuis with its industrial-chic décor and delicious seafood, or an authentic Italian meal with great coffee overlooking the canal? Apparently, it is also a bit of a mecca for vegetarians. So, toss a coin or go to Trip Advisor for recommendations. The flower market at Kouter Square has been exhibiting and selling flowers and plants here since the 18th century, and it is a wonderful place to wander on a sunny Sunday morning. Awash with spring colours, the square also boasts a large bandstand, and we arrived just as a local band began to play a number of hits from popular musicals. Everyone was toe-tapping to Disney’s Under the Sea and Tequila, and one homeless gentleman was clapping his hands in delight. In March, most of the exotic and delicate plants like orchids were protected from the cold in large tents warmed by giant heaters. In June they were soaking up the sunshine with the rest of us. 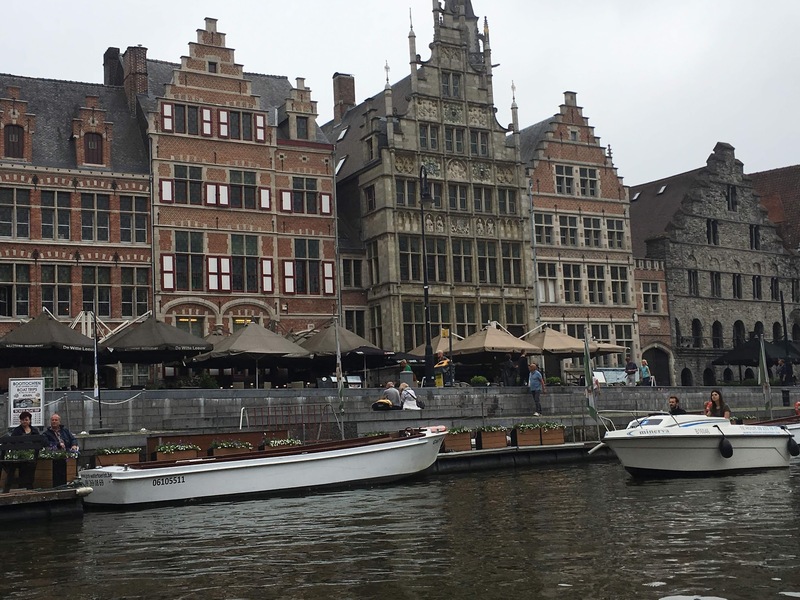 Ghent also has a couple of castles and cobbled lanes full of tempting fashions, a design museum and the UNESCO World Heritage belfry with great views from the top and a dragon that has been guarding the city since 1377. There are markets galore including a food hall in an old church, known as The Holy Food Market, and of course there is beer. And there are numerous boat trips on offer, which was my prime motivation for getting up on Saturday morning. Our tour guide showed off his expertise in four languages, as we puttered through the canals, although I would warn against sitting too close to the engine, or you won’t hear a thing, even when its in English! We loved this behind-the-scenes view of the city, and undoubtedly, the best view of Gravensteen Castle is from the moat, in a boat. We also got to cheer on two young women abseiling off a building beside the canal. I guess if they slipped, they were less likely to break their necks, and would only get an unplanned swim! There is plenty more that I will leave you to discover on your own, but the best part, for us, was that we were able to spend the whole weekend on foot – apart from our boat tour. Much of the old town centre has been pedestrianized, just beware the myriad bikes and trams. As the Lonely Planet guide says, Ghent is ‘small enough to feel cosy but big enough to stay vibrant.’ Final tip. Don’t forget to take your appetite and your camera – and remember to bring some chocolate home for your friends! This entry was posted in Belgium, Food & Wine, Travel and tagged Belgium, Ghent, Gravensteen Castle, Holy Food Market, Kouter Square, Pakhuis, The Adoration of the Mystic Lamb, vgetarian. Bookmark the permalink.